Brock Lesnar looks on during a workout prior to his victory over Mark Hunt.at UFC 200. UPDATE [Saturday, 12:30 p.m.] - Brock Lesnar released a statement to the Associated Press, saying, "We will get to the bottom of this." The AP is also reporting Lesnar passed three samples submitted in the middle of June, according to copies of three letters they obtained from the U.S. Anti-Doping Agency. UPDATE [Friday, 11:50 p.m.] - UFC heavyweight Mark Hunt isn't too happy about the situation. According to MMAFighting.com, Hunt wants half of what Lesnar earned for the fight or to be released from his UFC contract immediately. The cheaters get a slap on the wrist and walk off. What penalty or deterrent is there to make them think twice? Nothing. And the [Nevada Athletic Commission], why should these [expletive] get anything? They are not the ones who had to fight with Lesnar or lose [to him]. I lost. Later, Hunt changed his mind and said he wants all of Lesnar's UFC 200 winnings. It would mark the third time that Hunt faced a competitor in UFC that failed a drug test, if Lesnar did indeed test positive. Antonio Silva and Frank Mir also tested positive for an anti-doping violation after Hunt faced them in the octagon. Brock Lesnar has not performed for WWE since WrestleMania and is not scheduled to return until Sunday, Aug. 21. Brock Lesnar’s MMA career is now in jeopardy due to a possible anti-doping violation, the UFC has announced. According to the sport's biggest promotion, they learned of Lesnar’s potential violation on Thursday night from an out-of-competition sample collected by the USADA on June 28th. The UFC organization was notified today that the U.S. Anti-Doping Agency (USADA) has informed Brock Lesnar of a potential Anti-Doping Policy violation stemming from an out-of-competition sample collection on June 28, 2016. USADA received the testing results from the June 28, 2016 sample collection from the WADA-accredited UCLA Olympic Analytical Laboratory on the evening of July 14, 2016. USADA, the independent administrator of the UFC Anti-Doping Policy, will handle the results management and appropriate adjudication of this case. It is important to note that, under the UFC Anti-Doping Policy, there is a full fair legal review process that is afforded to all athletes before any sanctions are imposed. The Nevada State Athletic Commission also retains jurisdiction over this matter as the sample collection was performed in close proximity to Lesnar’s bout at UFC 200 in Las Vegas. Consistent with all previous potential anti-doping violations, additional information will be provided at the appropriate time as the process moves forward. 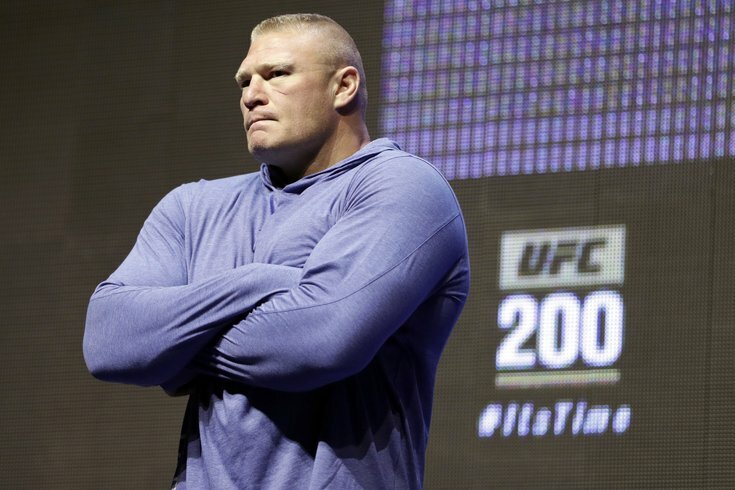 Lesnar's return to MMA, which occurred on Saturday night at UFC 200, was announced in June. He was reportedly tested at least six times before the pay-per-view. Per UFC policy, an athlete must give four months notice before returning to the octagon after being retired, but they waived that in order to allow Lesnar to compete against Mark Hunt, who he defeated after more than four years away from the sport. The main event of UFC 200 was changed just days before after UFC Interim Light Heavyweight Champion Jon Jones tested positive for a banned substance. Daniel Cormier, the current UFC Light Heavyweight Champion, took on Anderson Silva instead. The substance Lesnar tested positive for has not been released as of yet. USADA will conduct a full investigation into the matter before any sanctions are imposed on Lesnar. He could face a suspension of up to two years. Lesnar has yet to test positive for anything in WWE’s Wellness Policy, which is different than UFC’s program. WWE superstar Roman Reigns is currently serving a 30-day suspension for testing positive for a substance, which WWE has also not made public. What does this mean for Lesnar in WWE? There are many avenues this could take. Lesnar can request a “B” sample under UFC’s policy, and also can file an appeal. Lesnar has not publicly commented on the possible violation as of yet. WWE has also not released a statement at this time, and has yet to respond to a request for comment. We will update this post if they respond to our request. You can find information about USADA’s and UFC’s anti-doping policy here.